Here at InsideTracker, we love making our products even better than they already are. That's why we're excited to announce the addition of the CBC panel to our Ultimate and DIY panels. The complete blood count, or CBC, is one of the most common doctor-ordered blood panels in the US. While your doctor is most likely to send you to the lab for a CBC test when they suspect you may be anemic, have an infection, or a clotting problem1, this test actually measures a set of blood biomarkers that can reveal a lot about your overall health and performance. Jane has been running about 30 miles a week on roads. She’s been having some joint pain but otherwise feels fine. Because she wants to boost her performance this year, Jane chooses an InsideTracker Ultimate plan with CBC. Her RDW4 (Red Cell Distribution Width), hsCRP and ferritin5 are elevated – a sign that she may have some systemic inflammation that is contributing to her joint pain. Adding probiotic foods such as kefir or yogurt to her diet can help her to reduce her inflammation6. Elevated RDW7 may also be a clue that Jane’s red blood cells are breaking down because of the impact of running on pavement. She should try replacing some of her running workouts with cycling or do some of her running on trails. Tanya recently took a new job and moved to a downtown apartment. She’s excited about work, but doesn’t have the energy she usually has. Her InsideTracker test shows decreased hemoglobin and a lower MCV8 (Mean Corpuscular Volume), indicators that she may be a little iron deficient. Tanya adds more iron-rich foods, such as beef and teff bread to her diet and starts to feel more energetic. If you’re an athlete, you may often focus on the more tangible effects of training to gauge whether you might be pushing yourself a bit too hard. You may notice how sore your muscles get or whether your joints are aching a bit more than usual. But blood itself is a key player in performance both on the field and at the office. The cells carried in the blood supply the necessary oxygen and stave off potential for infections as we crank up the pressure on our bodies through intense training sessions and the daily stresses of life and work. The whole system, too, can get “overtrained” and the most direct way to tell where you stand is to track what’s in your blood over time. The CBC will do just that because it can indicate the potential for oxygen transport throughout your body, as well as give you a more detailed look at your immune system. With proper baseline values established, the CBC can also help athletes gauge the effects of your training program, and provide you with objective guidance on where your weak points may lie. In managing life and work stresses, the CBC can help you see what changes you might need to make to be successful without undermining your health. What exactly does the CBC measure? To make the CBC more meaningful, InsideTracker will show these markers within two related groups of markers: the Iron Group, the Inflammation Group, and the Platelets Group. The Iron Group includes hemoglobin, hematocrit, RBC, MCV, MCH, MCHC, RDW. If you choose the Performance or Ultimate plan, ferritin will also be part of the Iron Group. The Inflammation Group brings together the white blood cell count and related CBC markers. Ultimate and Performance users will also find hsCRP in the Inflammation Group. With the more detailed view of the immune system that the Inflammation Group offers, the zinc marker provides little additional information so it is no longer included in InsideTracker plans. By grouping the CBC markers with markers that have related functions, InsideTracker’s analysis is richer, simpler, and more helpful. All the cells in our blood are produced within the bone marrow from a small population of stem cells, which are a type of special, self-renewing cell. Hematopoiesis refers to the making and development of blood cells, and the bone marrow serves as the major site for this assembly line that ultimately results in what you see on your CBC blood test. Folate and vitamin B12 are both involved in the production of virtually every marker on the CBC. Having both these markers and the cellular components in your test results enables InsideTracker’s evidence-based algorithm to provide you with a more detailed snapshot of your biochemical status and more focused recommendations for optimizing yourself. Hemoglobin — Hemoglobin (Hb) is the essential component in a red blood cell. Your hemoglobin result shows how much of this important oxygen-carrying protein is in your blood, and it’s the most direct measure of oxygen-carrying capacity on the CBC test. Hematocrit — Hematocrit (Hct) refers to the percentage of blood that is composed of red blood cells and it is another great indicator of how much oxygen your blood can carry. A balanced hematocrit is crucial to both optimize athletic performance and to ensure your cardiovascular system is tuned to minimize stroke risk. 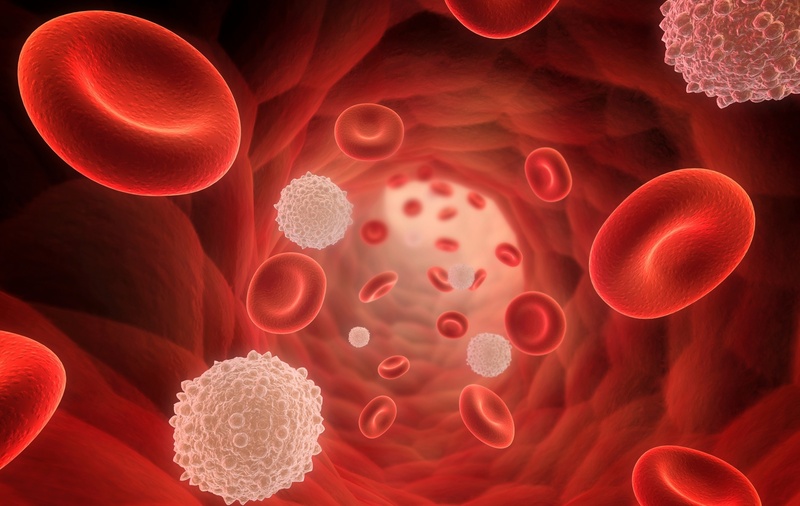 Red blood cell count — The RBC count is exactly what it sounds like -- the number of red blood cells in your blood -- and, along with the related measures, or indices, is an indicator of the overall potential of your blood to carry oxygen. A low RBC count could mean that your red cells are breaking down too fast or are not being made quickly enough because you lack certain nutrients, which can arise if your diet does not include enough foods rich in vitamin B12, folate and/or iron. Mean corpuscular volume (MCV) — MCV measures the average size of the red blood cells. 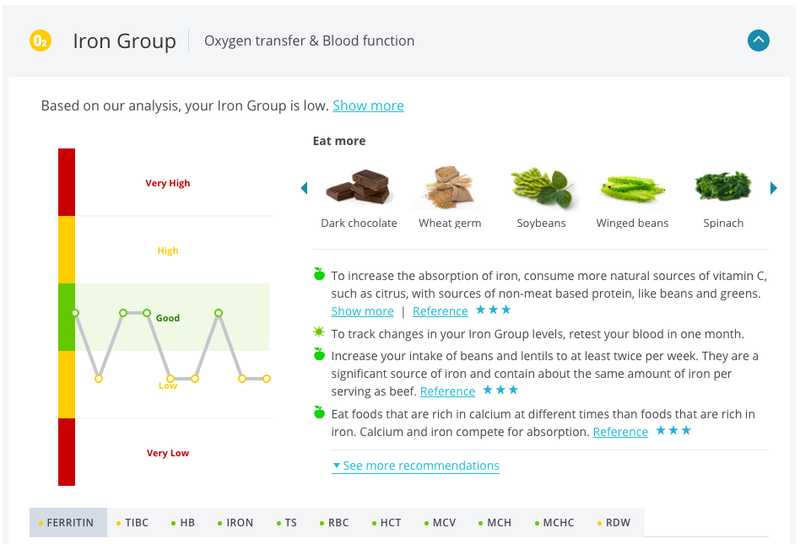 This information can be valuable because larger cells can potentially carry more hemoglobin (Hb) and thus more oxygen, whereas smaller cells can indicate or confirm (if measured along with other InsideTracker iron markers) iron deficiency. Mean corpuscular hemoglobin (MCH) and mean corpuscular hemoglobin concentration (MCHC) — MCH and MCHC are two ways of calculating the average amount of Hb in a red blood cell. These two markers are complementary to the Hb, Hct, and RBC measurements in that they describe the potential for the average red blood cell to transport oxygen through our bodies. Remember that MCH and MCHC are averages. Your red blood cells vary in size and the CBC tells you how large the variation is with the red cell distribution width. Red cell distribution width (RDW) — The RDW is an indicator of how uniform in size (or volume) the red blood cells are. So, a high RDW means that there is a big variation in the size of the RBCs within your blood sample. A high RDW can suggest nutritional deficiencies (e.g vitamin B12 or folate), and when combined with a low MCV measurement, it means that you’re iron deficient. Additionally, an elevated RDW reading may be a sign that you have chronic inflammation. White blood cells (WBC), or leukocytes, comprise about 1% of blood volume and they are responsible for protecting us from infectious or otherwise foreign agents, such as viruses, bacteria, or toxins. When your body detects an intruder or some type of stress, WBC can mobilize and increase (or decrease) in number as part of an inflammatory response. The differential part of the CBC breaks down the WBC number into specific types of these immune system soldiers that can give clues as to what may be causing the inflammation. White Blood Cell (WBC) Count — While the total white cell count (WBC) provides a useful summary in the context of the many other biomarkers that are part of InsideTracker, it is even more powerful when you include all the different types of white blood cells that make up the count. For example, the white blood cell count could appear normal while major shifts in the different types of white blood cells could be taking place in the background. 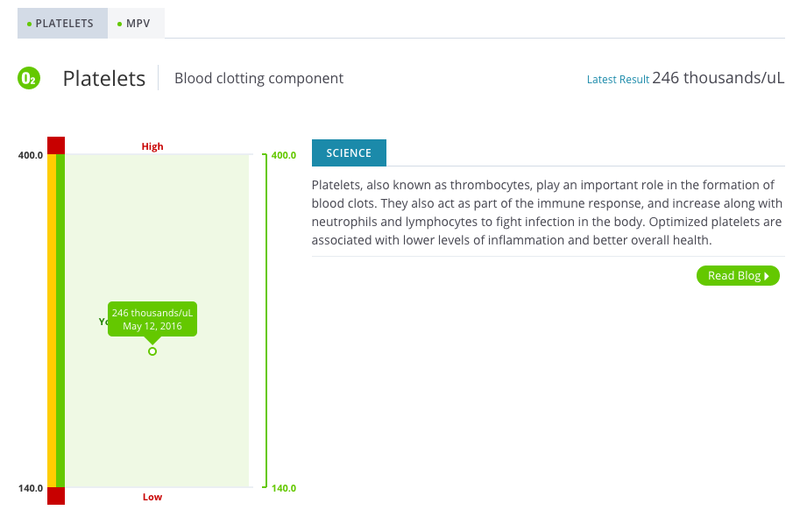 But, with information about neutrophils, lymphocytes, monocytes, eosinophils, and basophils, InsideTracker’s Inflammation Group will provide you with a more detailed look into the status of your immune system. Here’s a quick summary of what some of these different types of white blood cells do and what readings outside of the optimal zone may mean for you. Neutrophils — This type of white blood cell accounts for about 70% of all white blood cells. Neutrophils are the first and primary responders to bacterial infections. However, emotional and/or physical stress can also trigger a rise in the numbers of these cells. Conversely, lower neutrophil numbers may be seen in viral infections or as an adaptation in hard-training endurance athletes. Lymphocytes — Lymphocytes typically represent 20-40% of the circulating white blood cells. The workhorses of the immune system, lymphocytes are the bulwark in our body’s specific defense tactics against a virtually infinite list of potentially harmful pathogens or toxins. A high lymphocyte count can occur in the presence of a viral or bacterial infection or an acute stress response. Monocytes — Monocytes are the biggest of the white blood cells and constitute between 3-8% of the total white blood cells. They defend against infectious agents by essentially swallowing them up. Increased monocytes can also indicate chronic inflammation. Basophils and Eosinophils — These are the least common of all white blood cells and increased levels can be seen in allergic reactions or parasitic infections, whereas low numbers are a bit more tricky to define because of the already low levels of these types of cells in our blood. Platelets, or thrombocytes, are involved in the formation of blood clots and can assist neutrophils and lymphocytes in the inflammatory response.2 When platelets are activated and aggregate, their size as measured on the CBC may also increase, and this can sometimes increase the risk for cardiovascular problems, so it is important to keep the platelet count and MPV within your optimal range. How does the CBC fit into InsideTracker tests? 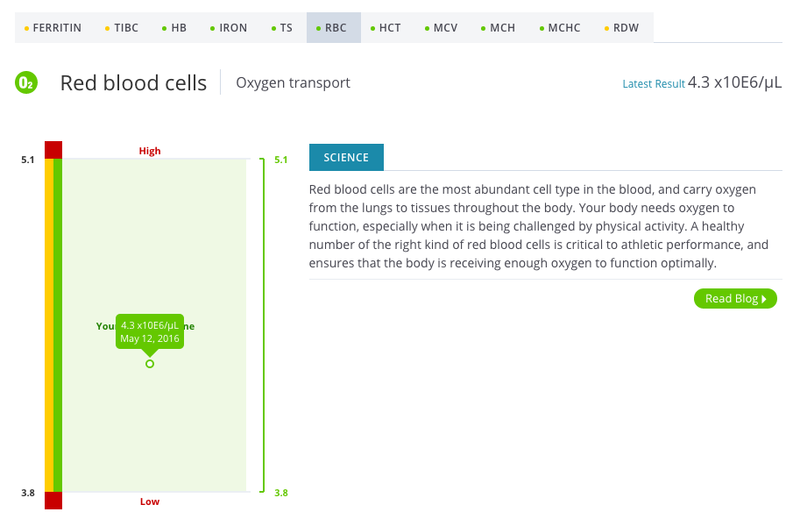 After carefully considering a large body of relevant peer-reviewed scientific research, we decided that the best way to incorporate the CBC into InsideTracker was to group the red blood cells and indices with the iron-related biomarkers and to create an Inflammation Group with the white blood cell counts and all the types of white blood cells. In this way, we’ve enriched each of these groups with layers of information that adds context to the rest of the biomarkers within the group. These are just a few examples of how the CBC markers help InsideTracker give you a more comprehensive view of your overall health, immune status, and iron status. With the addition of the CBC, InsideTracker has become even more personalized and information-rich than ever before! Wondering how your biomarkers affect your body's biology? We've created this e-book as a FREE resource to break down the science! Garraud O, Cognasse F. Are Platelets Cells? And if Yes, are They Immune Cells? Frontiers in Immunology. 2015 Feb 20;6:70. Bonaccio M, Di Castelnuovo A, De Curtis A, Costanzo S, Persichillo M, Donati MB, Cerletti C, Iacoviello L, de Gaetano G;Moli-sani Project Investigators. Adherence to the Mediterranean diet is associated with lower platelet and leukocyte counts: results from the Moli-sani study. Blood, 2014 May 8;123(19):3037-44. Lippi G1, Targher G, Montagnana M, Salvagno GL, Zoppini G, Guidi GC. Relation between red blood cell distribution width and inflammatory biomarkers in a large cohort of unselected patients. Archives of Pathology & Laboratory Medicine. 2009 Apr;133(4):628-32.